Plus is a specially blended co-polymer emulsion along with effective resistance additives to modify asphalt emulsion sealer to achieve out-standing toughness, color enhancement, fast curing time, greater flexibility, high viscosity, good suspension of the aggregates. It is recommended on any asphalt surface where there are high traffic patterns. Excellent for commercial and industrial parking lots, airport runways, traffic safety islands and service stations. RaynGuard Quick Dry is a specially blended additive formulated to significantly accelerate drying times for asphalt emulsion based sealers. 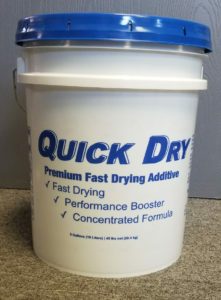 Quick Dry contains advanced polymers and reactive features that are designed to free the water molecules from the sealcoat to the surface to speed up evaporation. • Promotes quicker water release therefore enhancing drying/curing times. • Improves the heat and moisture resistance of the asphalt sealer. • Adds to the overall toughness of the finished product. Improvement in dry film strength. 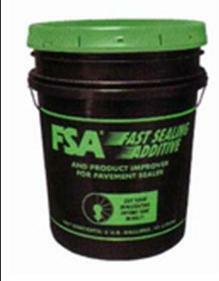 FSA is a unique silicone fortified latex copolymer especially formulated for use with pavement sealer. It provides workability and handling of pavement sealer, adds measureable value to the material in which it is used, and reduces drying times by 50% or more. By shortening drying time, labor costs and down-time can be reduced. Less expensive than other sealcoat additives, FSA stops tracking, sand roll out and filter/tip clogging. FSA is not an extender or bulking agent.